In 2017, foreign direct investment (FDI) attraction was one of the most impressive highlights of the Vietnamese economy. Not only being highly regarded for having geopolitical and economic stability, efforts for a better business climate are also seen as a leading drive to boost FDI. Nguyen Van Toan, a specialist in foreign investment, said that in 2017 Vietnam’s FDI attraction was its best in 10 years. The latest statistical report showed that Vietnam drew a 10-year high of US$35.88 billion of FDI in 2017, an increase of 44.4 per cent over 2016. Along with that, the value of disbursed FDI reached US$17.5 billion, the highest ever. 2017 witnessed a lot of billion-dollar projects in Vietnam, mainly from key investors such as South Korea and Japan. The biggest was the US$2.79 billion Nghi Son 2 Thermal Power Plant invested by Japanese investors in Thanh Hoa province, which will design, build, operate and transfer a 1,200-MW coal-fired thermal power plant. The runner-up was the US$2.58 billion, 1,320-MW Van Phong 1 BOT Thermal Power Plant, also invested by Japanese investors. The third biggest was Samsung Group’s US$2.5 billion expansion into its Samsung Display facility in Bac Ninh province. In total, foreign investors registered to invest over 2,300 fresh projects, registered to adjust their investment capital to 1,100 projects, and conducted more than 4,500 equity purchase deals in 2017. According to data released by the Foreign Investment Agency (FIA) under the Ministry of Planning and Investment, the FDI sector’s export value (including crude oil) reached US$155.24 billion in 2017, rising 23 per cent over 2016 and accounting for 72.6 per cent of the country’s exports. If crude oil was excluded, the value would be US$152.34 billion, up 23 per cent year on year and equal to 71.2 per cent of the country's exports. Their spending on imports was US$126.44 billion in the year, representing a year on year growth of 23.4 per cent and accounting for nearly 59.9 per cent of the country's total imports. Overall, the FDI sector enjoyed a trade surplus of US$28.8 billion (including crude oil) in 2017. 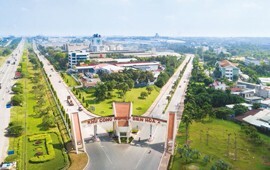 As one of the first people in charge of exercising State management over FDI, Professor Nguyen Mai, Chairman of the Vietnam Association of Foreign Invested Enterprises (VAFIE) and former Vice Chairman of the State Committee for Investment Cooperation (SCCI), commented that the FDI sector made important contributions to Vietnam’s achievements over 30 years of renovation and integration. It contributed 22 - 25 per cent of total social investment capital from 1991 to 2017 or US$161 billion (realised capital), accounted for more than 50 per cent of total industrial production value (biggest petroleum, manufacturing, iron and steel, and oil and gas projects are owned by foreign investors), facilitated the shift and mobility of professions and trades in the society, employed 3.7 million direct workers and many millions of indirect workers. In addition, the FDI sector has shaped modern production, distribution and consumption modes in the society. From 1988 to 2017, the registered FDI value was over US$335 billion, of which only US$177 billion was disbursed into projects. The gap between registered capital and realised capital was nearly 50 per cent. Professor Nguyen Mai said two thirds of this gap was unreal. The unrealized value was grouped into three, with the first being completely unavailable (a third), the second being troubled investors who need to be reassessed for viability and interest, and the third being viable capital (only a third). Furthermore, it is high time for us to change our views on FDI attraction. In the past years, Vietnam has accepted tiny FDI projects with individual value ranging from a few hundred thousand US dollars to US$1-2 million. For the time being, local companies can handle such projects and for that reason we need to reshape our directions and goals of FDI attraction. We should focus on high-quality resources to approach future technologies and services and enter the Fourth Industrial Revolution. A very important point in the new FDI attraction orientation stressed by Deputy Prime Minister Vuong Dinh Hue is selecting and prioritising FDI enterprises that invest in line with restructuring orientations; giving priority to companies using advanced, environment-friendly technologies, having good governance, and having good production chains ready to connect with Vietnamese enterprises. “The objective is to make the two economic sectors grow and develop evenly to strengthen the economy,” he said.